There are always so many spring-training home runs. Generally speaking, there’s no reason for you to care about spring-training home runs. You might consider caring about this spring-training home run. The stakes almost couldn’t be lower. The bases were empty in the bottom of the fifth of a game in the last week of February. Had the exhibition not been televised, that home run would live only in Twitter descriptions. But that’s a video of Aaron Judge going really, spectacularly deep, and that video immediately made the usual rounds. As spring training goes, that was headline news. Judge, right now, is a 24-year-old with 95 big-league plate appearances, and a .608 big-league OPS. When he did come to bat for the Yankees, he struck out close to half of the time, so in that sense he is completely unproven. Yet there’s this one thing he doesn’t have to prove anymore. Aaron Judge doesn’t just make regular contact. When he makes contact — if he makes contact — it’s easy to see why the comparisons to Giancarlo Stanton are no exaggeration. Just physically, there’s a natural parallel. Judge bats right-handed, and he measures 6’7. Stanton bats right-handed, and he measures 6’6. The official roster pages claim Judge has 30 pounds on Stanton, but I never know to what extent I should take those numbers seriously. Now then, you’ve got two absolute mammoths. One of them is an elite-level slugger, while the other hopes to be. And even the swings don’t look so different. I don’t know if “effortless” is the right word, but the swings feel almost short. There are two primary reasons for that: One, you’re seeing the front elbows tucked in, and both hands remain on the bat as it wraps around. And two, the swings are quick. They’re quick because of the bat speed. The bat speed is where the strength comes from. There’s a different trigger mechanism being used, but those sometimes change over time. Maybe Judge will keep the leg kick, and maybe one day he’ll abandon it. But when Aaron Judge’s swing is right, he generates that Giancarlo Stanton kind of sound. It’s a rare trait, and maybe the most desirable possible building block. According to Baseball Savant, Stanton owns the hardest-hit home run of the Statcast era, measuring in at 119.2 miles per hour. Stanton has established himself as exceptional when it comes to peak exit velocities, sort of like the offensive version of Aroldis Chapman’s fastball. Up there you see Judge hitting a home run at 115.2 miles per hour. For sure, that is inarguably still four ticks short of Stanton’s home-run peak. Yet Judge hasn’t built up much of a sample size. That’s a mark he’s reached already. Before I get to my favorite plot, let me repeat that Judge struggled badly in his brief big-league stint. In 95 trips, he struck out 44% of the time. In Stanton’s first 95 career trips, he struck out 40% of the time. Yes, every player is different. Yes, Stanton was considerably younger when he made his debut. But from that initial stretch forward, as a rookie, Stanton posted a strikeout rate of 28%, with a 135 wRC+. Don’t overreact to Judge’s first cup of coffee. Especially when you see how the ball came off of his bat. Judge, last year, hit just 43 balls in play. It’s a small sample, obviously, but there’s still data for it. 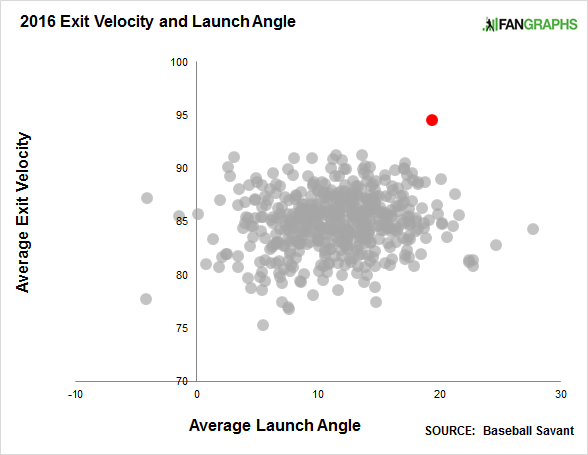 In this plot, you’ll find average exit velocities and average launch angles for 2016. I’m using Jeff Zimmerman’s corrected exit velocities to fill in empty gaps. I highlighted Judge in red, but his point already stood out just fine. Even though I’m working here with a very low ball-in-play minimum, I think it’s significant that Judge averaged the highest exit velocity out of everyone. And he wasn’t just the highest — he was the highest by more than three full miles per hour over Miguel Cabrera and Nelson Cruz. And Judge is also there with a top-20 launch angle, showing that he hits the ball hard, and he hits the ball in the air. Not too much in the air, but more like right in the barrel zone. Judge averaged the same launch angle as Kris Bryant. He had the higher exit velocity by almost eight ticks. There’s an ease with which Aaron Judge clobbers the baseball. It’s not actually easy, but Judge’s giant body allows him to swing a heavy bat super fast, and that’s how you get light-tower power. The problem, as usual, is contact consistency. Some players struggle between peak contact and weak contact. Judge struggles more between peak contact and no contact. He swung through a lot of baseballs in the majors, but even in Triple-A, his contact rate was well below the league standard. Judge made contact with 72% of his swings. The league average was six points higher. On the other hand, Judge had his league’s third-lowest ground-ball rate. He had one of his league’s highest walk rates. And he more than doubled his league’s rate of homers per fly. Judge took a significant step forward in the high minors, and he doesn’t whiff because he’s a hacker. He’s more disciplined than that, and his whiff issue is by no means the worst. Consider, say, Joey Gallo. Gallo’s contact rate in Triple-A last season was 10 points worse than Judge’s. When George Springer was in Triple-A, his contact rate was several points worse than Judge’s. Miguel Sano has always had a contact problem, but his power has let him compensate for that. Judge has the same sort of power, and he probably comes with fewer defensive question marks. Aaron Judge isn’t a complete player today. He still has some hitting techniques to learn, and he might need to keep his front leg quieter. He might stand so tall in the box that he has a balance issue, which could contribute to inconsistency. But there’s no such thing as a hitter who’s perfectly consistent, and Judge’s power already ranks him among the very best. His eye, for the most part, is fine, and as long as he has his body under control, perhaps the biggest improvement to be made is simply learning more about how pitchers are going to attack. In Judge’s first exposure to Triple-A, he was a league-average hitter. The next time around, his wRC+ was pushing 150. He’s seen the bigs, now, for a month. He probably learned a few things. We hoped you liked reading It’s Difficult to Exaggerate Aaron Judge’s Power by Jeff Sullivan! If Judge can hit .240 with a bunch of walks, he could be a lot of fun. Chris Carter? All he does is catch touchdown passes! All Cris Carter does is catch touchdowns. All Chris Carter does is hit dingersssss.